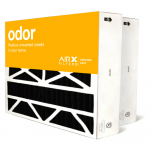 Dimensions: 19 3/4" X 24 1/4" X 6"
These premium quality odor reduction carbon impregnated pleated filters are interchangeable with existing HVAC filters. This specialized media used in the filter offers BOTH particulate and molecular filtration. Odorous gases and vapors are attracted to and held by the unique properties of the activated carbon material. Our media not only attracts and holds small particles, it removes formerly unfiltered gases and odors from the air. And it does it all in one filter! These pleated filters are made to be installed in the Aprilaire/Space-Gard 2200 and 2250 Air Cleaner. They are fully expanded - and no assembly or pleat spacers are required. Simply place the filter in the plastic inner housing and slide it in!